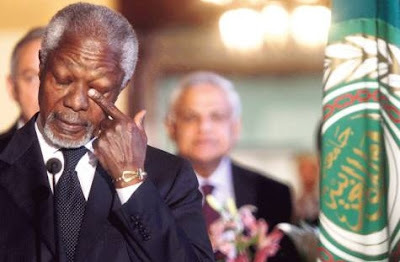 In this Image, Former United Nations Secretary General, Kofi Annan does not believe what he is hearing. Self-touching fits into a class of body language behavior that are known as manipulators, adaptors or pacifiers (aka MAPs). MAPs in general (although there are exceptions) are signals of anxiety. When MAPs are displayed on the front (anterior) portion of the head/face, there is a significantly increased chance that the person is either hearing or is witnessing what he/she considers to be a lie. This is particularly true when one eye is rubbed, as the Nobel Peace Prize winner is doing (When two eyes are rubbed however, it has a completely different meaning). Interestingly, the co-existing nonverbal cluster-combination we see here - the contracture and elevation of Mr. Annan's entire forehead, together with the one-eye rub - has an extremely high correlation with the witnessing of deception. The closing of the opposite eye, along with the downward (flexing) tilt of the head & neck, brings our conclusion of a lie-witnessing diagnosis to a virtual 100% confidence level. Mr. Annan arrived in Syria today where he met with Syrian President Bashar al-Assad in an attempt stop the death and bloodshed of Syrian civilians. They are scheduled to meet again tomorrow.